Operation School Invasion (OSI) is a successful programme launched by local charity organisation Alive Project late 2016. By middle of 2017, We have worked with over 25 different schools, 300 sporting clubs and approximately 9500 students and young people. The workshops were launched from a need arising from the gaps between increase in suicide rates, increase in clinically diagnosed mental disorders in youth and available remedial treatment. Workshops completed have had excellent feedback from participants and noticeable short term and sustainable long term change by surrounding carers and peers. OSI’s workshops utilizes a unique blend of lessons delivered in short age/situational relevant keynote fashion, with alternative therapeutic physical activities to reinforce the keynote delivered. Alive uses activities such as movements from Brazilian Jiu Jitsu / Mixed Martial Arts, Equine (horse) therapy, farming style workshops and outdoor adventure activities. The integrated blend of Alive’s delivery methods ensures that participants are learning life lessons in a way that is fun, engaging and applicable. The aim of ALIVE is to build more resilient young people and communities. ALIVE offers support programmes for emotional and mental wellbeing to young people. Our projects are designed to enhance the resilience, self-esteem, values and tools to help young people to thrive in life. Education programs and supports are delivered through various forms of coaching in non-clinical setting. Run by a high skilled team of Psychologists, including our in-house Director of research, Councillors, Mental Health professionals, Coaches, Youth workers, BJJ and MMA coaches and leaders in their field. 3) To improve and make sustainable the general mental state of participants within the outside the workshop environment. We utilize a holistic approach and enormous amounts of fun with a mix of BJJ, fitness, MMA, Horse riding and animal assisted learning, Art expression and farm therapy and great chats. ALIVE facilitates 1 – 2 hour workshops for Students across the school, PD for Teachers and Parent talks to ensure school wide training and support. These workshops have ALIVE’s unique blend of 12 signature lessons with activities such as BJJ movements, games, and practical life skills. In addition to onsite workshops ALIVE offers offsite workshops incorporating Farm and Equine Empowerment events and Leadership Camps. 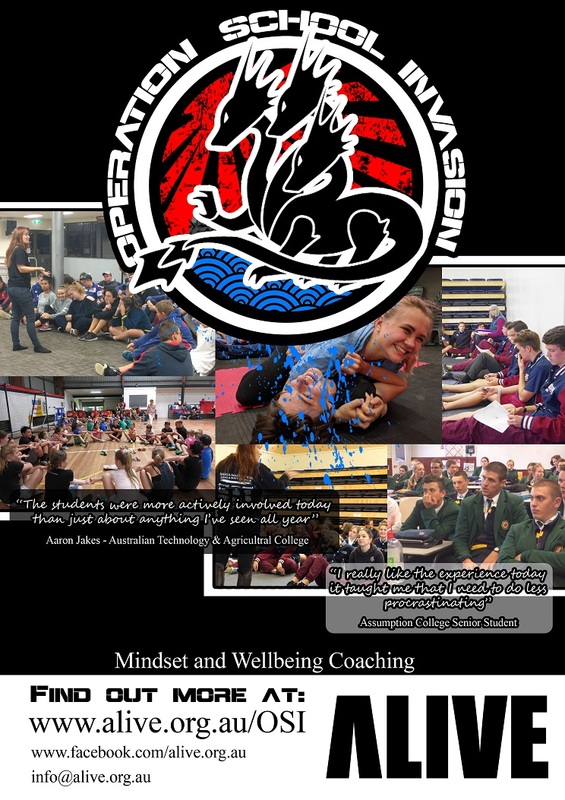 Please download our Schools Brochure for more information on our programs. A huge thank you for the PD sessions that you delivered to the teaching staff at Australian Technology and Agricultural College. The content and delivery was inspiring, I found it to be the most beneficial and relevant PD session I have ever attended. Working with youth is an extremely rewarding and challenging profession and I would like to express my gratitude for the knowledge, experience and extremely valuable tools you shared, which I can now apply to my own teaching practice. I look forward to working with you in the future. Erin Zammit Teacher ATAC college QLD. Craig Fatini Deputy Principal, Assumption College. The students were more actively involved today than anything I have seen them do all year, they loved it.